Litecoin is the world’s first altcoin which was created in 2011 by Charlie Lee, and like Bitcoin, it is also an open-sourced P2P digital currency. But unlike the turbulent surges in other crypto-coins, Litecoin has remained consistently in the list of top 5 cryptocurrencies in the world by market cap, and it has also proved to be a relatively safe bet in comparison its peers. Fun fact: In the last six months, Litecoin has grown more than 2000%, and is still increasing steadily. Litecoin is a decentralized currency used globally and permits the users all over the world to make payments in an instant and immediate manner. It is operated on the technology of block chains and does not have any centralized authorities. Litecoin has an enhanced efficiency and provides security. It offers complete financial control to the users and allows quick transactions. These are the reasons why Litecoin has become more precious in recent days. 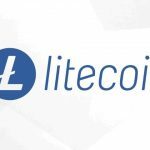 Many investors are now looking for ways to securely store their Litecoins, so we thought of coming up with a list of reliable and safe Litecoin wallets. Your Litecoin wallet will be perhaps the most important tool you have for securing and protecting your Litecoins. That’s why it’s very important to make sure you take some time to familiarize yourself with them! A Litecoin wallet is a software program or an application that allows you to send, receive store your Litecoins (LTC) safely. There are different types of wallets available on the market. Some LTC wallets focus on security while some are easy to use but compromise security. Some wallets allow you to check your transaction history instantly. On the other hand, some wallets need to be connected to their respective portals/sites in order to check the history or manage funds. The most secure wallet is the one where the Private Keys are owned by you. If you store your LTC on an exchange or site where you do not own the private keys, then you might lose your Litecoins in an event of a hack. The wallet should have an activedevelopment community or the company should be reputable. The wallet should be easy to useand navigate. It should be compatiblewith different operating systems and devices. It should allow you to control your private keys. Make sure that all these above points are fulfilled before selecting any cryptocurrency wallet. Web wallets – Your Litecoins are stored on someone else’s sever. Desktop / mobile wallets – Your Litecoins are stored on your device (e.g. your laptop). Each type of wallet has its advantages and disadvantages. Offline wallets are considered safer because someone will need physical access to your computer to steal them. However, you will also be able to send Litecoins only from that specific device. Web wallets are riskier because someone can hack the companies’ servers and steal your coins. On the other hand they can be used from anywhere in the world. Some wallets are free, while other wallets charge fees for various transactions. Make sure you read any fine print when choosing a wallet. Also, you should pay close attention to any fees, as they can add up very quickly. Hardware wallets – These wallets are a small piece of hardware which store your private key securely. The device is connected to your computer via a USB portal. These types of wallets are the most recommended because they allow you to send and receive Bitcoins with complete security as all of the “important stuff” is done offline on the hardware device. However, they also come at a price. So without further delay, here is the list of different Hardware, Web, Desktop and Android wallets available to store your LTC securely. 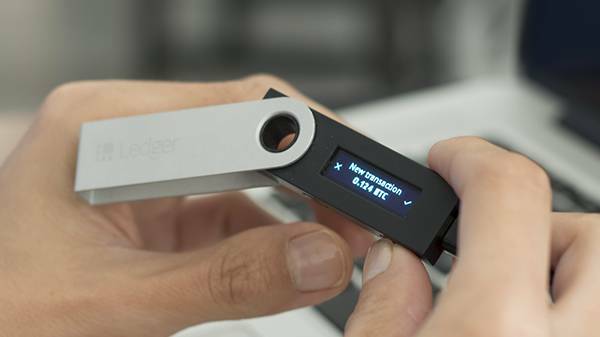 Ledger Nano S is one of the most popular and secure wallets currently available in the market, and it supports Litecoin. Ledger Nano S is a Hardware wallet. This means that you own the private keys of the wallet thus your Litecoins are extremely safe. It comes with an inbuilt OLED screen and in a stainless steel body, which makes it robust and attractive at the same time. This wallet needs to be configured when it is used for the very first time. You need to set a password (Private Key) and then you will get a 24-word phrase (Seed Key). This Seed Key will be required if you forget your Password, which means that you need to store this Seed Key safely. There will be no way to access your wallet ever again if you lose this Seed Key. Important Note: It’s highly recommended to make 2-3 copies of the seed key and store them in safe places. Ledger costs around $65. However, it’s worth if you want to store your currencies without any worry. And if you are a multi-currency lover, the great news for you is that Ledger Nano S allows you to store them as well. When Bitcoin price has skyrocketed, more and more people started worrying about its security. Hence, the Trezor wallet was born in a Czech Republic-based company known as SatoshiLabs, making it the world’s first HD wallet that came into existence, and being the oldest player in the industry, Trezor has a huge reputation. Trezor has a small OLED screen which shows a randomly generated nine digit pin code every time you want to access it. There is also a 24-word recovery seed to keep your funds safe in an offline environment. You will need this seed in case you wish to restore the wallet. Trezor is a very light and portable device, similar to the Ledger Nano S, but is a bit more expensive and costs $99. It is available in 3 colors – white, black, and gray. Atomic Wallet is a new multi-assets solution for convenient storage of Litecoin. For sure, Atomic can be used not only as LTC wallet: it currently supports over 300 coins and tokens. Besides, every weekly update adds new crypto assets and features. Desktop app is available for Windows, MacOS, Ubuntu, Debian and Fedora. Private alpha versions of Android and IOS mobile apps will be released in October, 2018. 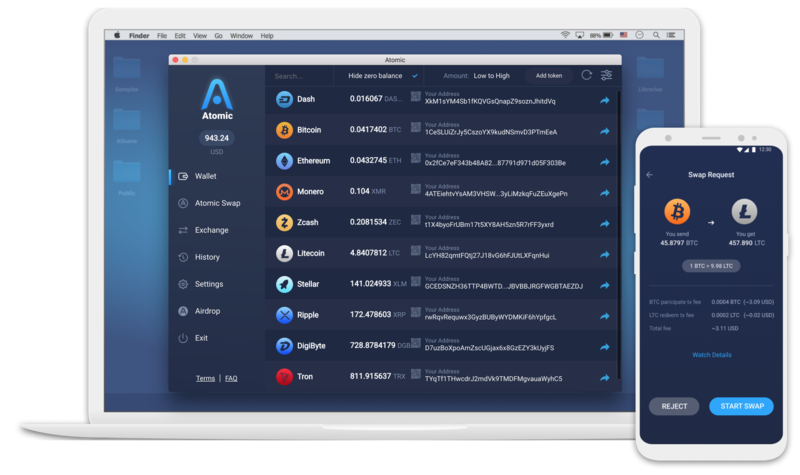 Atomic Wallet has user-friendly interface andworks with built-in Atomic swap exchange: this avant-garde feature helps users save significant amounts on fees. For those who want to exchange assets instantly, there are Changelly and Shapeshift options. Jaxx is popular multi-currency blockchain interface wallet that allows you to easily manage your cryptocurrencies on desktops and mobile. Jaxx is a great option for day-to-day use or accepting payments on the go, but it should not be used for large amounts of Litecoin. It is an HD wallet that supports 13 cryptocurrencies (including LTC) and allows to exchange currencies using Shapeshift. This is an amazing feature because it allows you to exchange any of your cryptos into any other crypto. Being an HD wallet, Jaxx allows its users to restore their funds with a 12-word backup seed key feature. This wallet is quite safe to store your Litecoins because you own the private keys and you can also export/import keys whenever required. Jaxx has an active development community, which has given it an easy to use interface. Jaxx is available on Chrome and Firefox extensions, iOS mobile/tablet, and Linux/MAC desktop versions. If you are looking for a Free LTC wallet, then you definitely have to try Exodus. This is also my favorite desktop wallet. 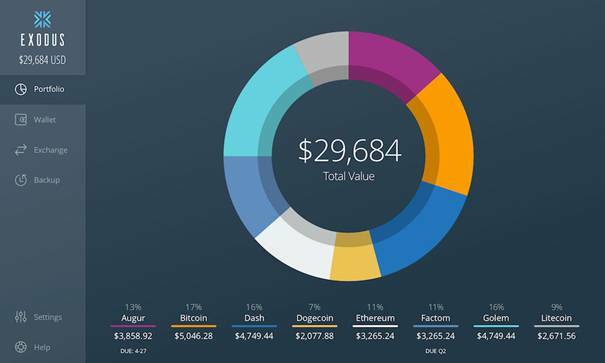 This wallet has a really attractive User Interface, and is absolutely free to use and is extremely safe. The only drawback is that this wallet can only be used on a computer (Windows, Mac, and Linux). Exodus is a multi-currency desktop wallet that supports Litecoin, Bitcoin, Ethereum and other cryptos. 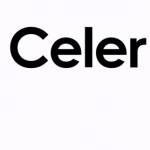 It is backed by an active development team lead by JP Richardson and Daniel Castagnoli. I like the fact that Exodus’s ease of use isn’t compromised by a lack of security. You will get a 12-word seed key. The seed key would be needed if you want to restore/recover your wallet in case your computer gets damaged. For multi-cryptocurrency lovers, there is even an inbuilt ShapeShift converter, which you can use to exchange your cryptocurrencies instantly. It’s important to note that Exodus team is quite active and in case you face any issues, you would instantly get the solution. Litecoin Core is the official Litecoin Wallet and being an official wallet, it is extremely safe to store your Litecoins. This wallet is absolutely free to use and is available on their website. Litecoin Core is a free to use desktop wallet, which means that if you start using it, your desktop will become your LTC wallet, and your private keys will be stored there on the desktop itself. And remember that core wallets sync with the entire blockchain, so this could take a lot of time (up to 4-5 days). It is now available for Linux, MAC, and Windows. Rahakott wallets are also “algoristic”, according to a study by NewsBTC. com, which means that for each transaction new addresses are generated to increase the anonymity of users. 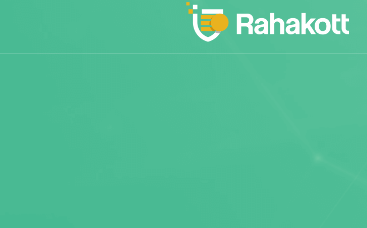 The Rahakott Wallet was introduced on November 12th. 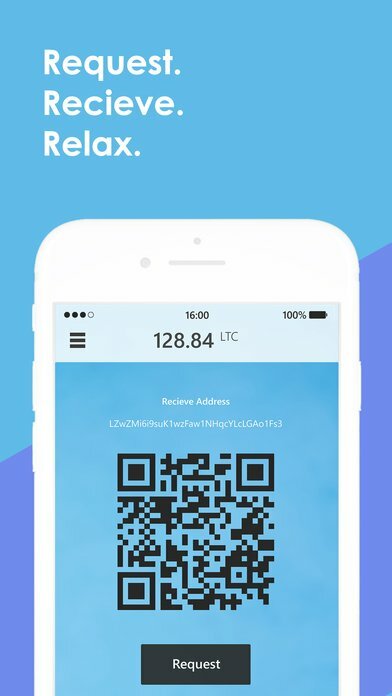 Developed by Charlie Lee, the creator of LTC, LoafWallet is the first iOS-only mobile wallet for Litecoin. This wallet is backed by Litecoin Association, a passionate group of volunteers who want to promote LTC. It also has a group of active developers behind it. LoafWallet is simple to use and has a very clean interface. It also allows you to restore your funds by using a 12-word backup seed key. These features make it a great choice for beginners. It also has an inbuilt feature that allows its users to directly buy LTC from Coinbase instantly. This is a free wallet and is available only for iOS users on the Apple App Store! Electrum-LTC is also a Desktop wallet. However, it is a bit faster and lighter than Litecoin Core. Electrum-LTC is a lightweight Litecoin desktop wallet that does not sync the whole Blockchain thus you can start using it as soon as it is downloaded. It is a deterministic wallet providing its users a 12-word seed which makes sure that your funds are safe and secure. It is SegWit-enabled, and it provides another feature where you can ‘freeze‘ your funds i.e. no one can send the Litecoin from that address. However, I wouldn’t recommend this wallet at all for those who are new to cryptocurrency world, because it does not have a clean UI and looks too much techy. It is now available for Linux, Windows, and Mac OS X operating systems. Litecoin Paper Wallet is perfect for those who have a large amount of Litecoins and want to store it for a longer period of time. If you are comfortable using paper wallets, you can make one at liteaddress.org. You can go this website and create your pair of private/public keys, and you need to store it in a very safe place. 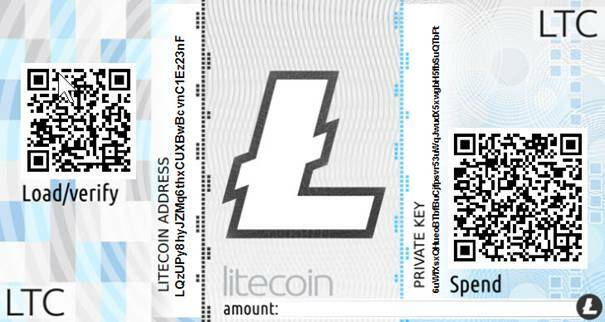 Unlike Hardware Wallets, Litecoin Paper Wallet is one of the safest and cheapest ways to store your Litecoins offline. However, if you don’t know how to properly handle a paper wallet, this can be tricky and a little bit risky. Important Note: It’s highly recommended to make 2-3 copies of your Paper wallet and store them in a safe place. So these were the Top 9 Best Wallets currently available in the market for storing litecoins. Litecoin is almost 6 years old in the crypto world, and the future of Litecoin is quite bright and you must invest some of your funds into it for long term profits. It initially had a slow growth. However, after Charlie Lee’s return as a full developer, and also SegWit activation, Litecoin has had quite a good price rally. I am sure many users will be on the lookout for more wallet options for LTC. However, more choices will be available for each type of user as the technology matures. Until then, I will keep on trying out more Litecoin (LTC) wallets and add them to this list.